“Come to play. Come to meet. Come to get down to business. We’re more than happy to welcome you home,” reads The Strathcona Hotel’s website. The premium downtown location at the intersection of Wellington St. West and York Street offers premium accommodation to professionals and tourists alike. Across the street from the historic Fairmont Royal York Hotel, Toronto Strathcona Hotel is nestled in the heart of Toronto, only steps from Union Station, and within two blocks of the Air Canada Centre, Rogers Centre, Metro Toronto Convention Centre, CN Tower, and in the midst of the theatre district and financial district. Toronto Strathcona Hotel offers its patrons all the comforts of home combined with one of the best Toronto locations for people to stay, play, meet, explore, and work. The hotel’s experienced staff can handle the needs of the most demanding patrons and exceed their expectations. The personnel at Toronto Strathcona Hotel work to deliver the best value for the dollar. As an independently managed hotel, Toronto Strathcona Hotel can even bend the rules to provide patrons with what makes them feel warm, welcome, and worry-free — this is what the hotel’s management understands under the usual clichés such as ‘value added’ and ‘the best service’, so often used by the competition. Life at Toronto Strathcona Hotel is fresh, functional, friendly, and fun. The contemporary guest rooms and suite accommodations at Toronto Strathcona Hotel combine style and substance and have been designed with the connected, wireless world in mind. Besides the well-maintained rooms, the hotel offers functional meeting and event space, accommodating staff, and a key location in Toronto. Toronto Strathcona Hotel also includes a superb dining experience at The York Street Café, dinner and drinks at The Strath Pub, as well as proximity to the Wellington Fitness Club, offering workout and massage services. As to the accommodations themselves, the company website reads,” It’s where style meets practicality. And form meets functionality. In other words, our hotel accommodations look really nice and are quite handy too. At your fingertips you’ll find everything you need. Our guest will experience our comfortable 9-inch mattresses, 220-thread count sheets, duvet bedding and eco-friendly amenities. European wood floors and California shutters complete our guestrooms. The hotel offers nine room types depending on the travellers’ needs. The Economy Room includes one single bed, best suited for a single traveler on a budget. The Smart Twin is the most affordable accommodation that features two twin beds. The Smart Queen features a queen bed, and a half-size rounded desk for business professionals. The Executive is bright and modern, designed for those who prefer a little extra space, and comes with a choice of queen, king, or two double beds. The Executive Suite features two rooms: a bedroom with a luxurious king size bed, well-lit desk, bathroom with marble flooring and jet shower, and a sitting room with a large sofa with the view of the amazing cityscape. The concierge desk opens at 8a.m. and closes at 4p.m. 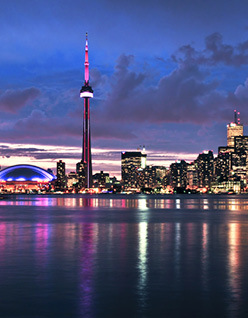 The concierge works to fulfill all patrons’ wishes, whether it’s to help and find their way around the city, provide tips about Toronto’s best tourism sites, or to advise about the best downtown restaurants. Room Service serves patrons who wish to enjoy a meal in the comfort of their own room from 7a.m. to 10p.m. The hotel’s laundry service provides the convenience of same day service Monday through Saturday. Of course, any special requests and wishes the patrons may express, the staff gladly help to provide. With one of the best locations in the downtown Toronto, The Strathcona Hotel represents one of Toronto’s prime meeting places. The hotel’s Wellington Room can accommodate anywhere between 10 to 50 people. The hotel accommodates meetings, conferences, training, weddings, and any other special occasions. The hotel also serves as the event planner, providing participants with an online booking service where the attendees are able to check availability, book their individual reservations at the negotiated group rates, and access hotel and city information 24 hours a day, seven days a week. The hotel also offers flexibility, service, and food and beverage excellence as a full service event planner. As an event planner, Toronto Strathcona Hotel has its finger on the pulse of Toronto tourism, and assists patrons in creating the perfect visit for groups, including food and beverage functions, destination activities, and everything in between. To best accommodate event planning, the hotel offer a “Hassle Free Meeting Package”, designed to offer groups a simple way to book a function, with floor plans and capacity charts and current menus. So to those traveling to Toronto who want to be a part of something special, Toronto Strathcona Hotel welcomes you.